1. The decor is fantastic. 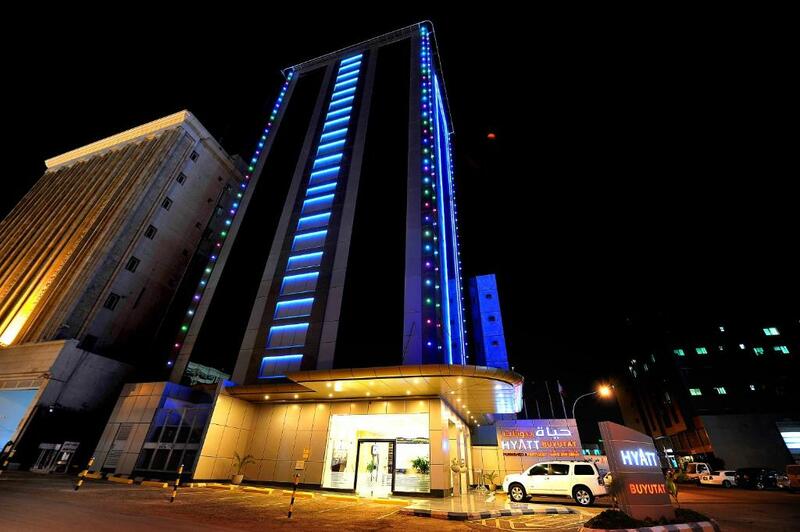 I love the design concept of the hotel. 2. Check In and out were done considerably quick. Location is good, apartments has everything you may need. Microwave, washing machine, kettle etc. Requested documents to be printed/photocopied and was delivered promptly at my doorstep. The location is great and next to all main streets. The room is clean and comfortable. The breakfast is in the basement next to the swimming pool. There was no fruit, breakfast was very basic. Wifi, Food and dinning area was very bad. Only Rooms facilities were very good. Outside view was very bad. Not worth to pay the amount. I will never select this property in future. the place is nice its just our bathroom bowl dont have flush.the pool is nice with the fitness center.breakfast is not that i expected few choices only egg and hotdogs cereals for kids,no fruits available only cocumber i found. but overall it was anice experience with the smiling and helpful staff. 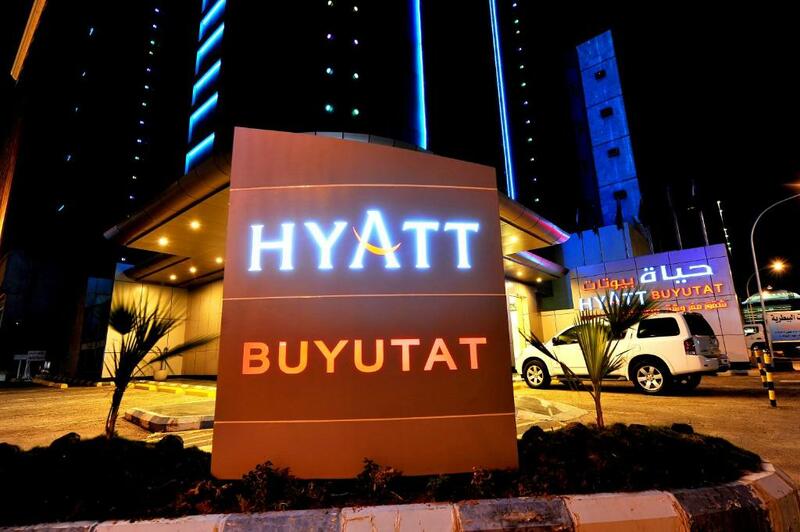 Located in the commercial district of Olaya in Riyadh, Hayat Buyutat offers free Wi-Fi in the entire hotel, an indoor swimming pool, a gym and a spa. It is just a 5-minute drive from the Al Faisalyah Tower. The self-catering apartments at Hayat Buyutat feature modern living rooms with black and white sofas. Each offers a flat-screen TV, a wardrobe and a video, while the kitchen includes an oven, a coffee machine and kitchenware. Guests can enjoy an energizing workout at the gym or a rejuvenating massage treatment at the spa complimented by the hot tub or Turkish bath. A billiards room is also available at the hotel. Al Kingdom Tower is 5 minutes by car from Hayat Buyutat, while Al Riyadh Mall is a 10-minute drive away where guests can go shopping. King Khaled International Airport is a 40 minutes’ drive away. Al Olaya is a great choice for travelers interested in business, luxury brand shopping and clothes shopping. This is our guests' favorite part of Riyadh, according to independent reviews. When would you like to stay at Hyatt Buyutat? House Rules Hyatt Buyutat takes special requests – add in the next step! ATM card Hyatt Buyutat accepts these cards and reserves the right to temporarily hold an amount prior to arrival. Hyatt Buyutat accepts these cards and reserves the right to temporarily hold an amount prior to arrival. 1. The pictures in Booking.com gives a completely different view of the rooms. The things have deteriorated (example the shower is broken and damaged, the beds seem old and not comfy enough). It needs a makeover project. 2. Beware, breakfast is crap. With a buffet variety of 4 dishes, it is almost impossible to have a proper breakfast. I had to go out and have from somewhere else. 3. Wifi is crap. Wouldn't consider this property again. Let's start from the beginning, NO WELCOME at all, Rude Reception Staff, They don't even bother to smile, greet or welcome guests. I never received a single greet or smile from check in Untill I Checked out. Corridor smells like coackroches.... Apartment was very small and congested, only 1 small water bottle complimentary, small bed room very low lighting, very old furniture, toilets are in bad condition, breakfast was just too ordinary with very limited items, and breakfast restaurants is at the basement beside swimming pool, that area it self is dirty, stinks badly and humid. not worth a single Penny of the price paid. You can find better service at way lower price at nearby Furnished apartments. The hotel wasn’t clean enaugh. There were only 2 towels in the washroom (and one of them looked not in a good condition). There is a smell of smoke in the whole hotel, including lobby and our room. When we came in from outside later that night, there were actually people sitting in lobby and smoking!!! Work trip. After traveling for more than 26 hours, arrived to property around midnight. Internet was not available until the following morning. "We have some problems with WiFi at night time". Had I known about that "detail" beforehand, I would have stayed somewhere else.